Founded in 1947, the Swiss manufacturer Phonak has been committed to changing lives and reconnecting people to their passions and loved ones with state-of-the-art hearing technology. Phonak continues to grow and innovate, and has made the promise to not rest until “wearing a hearing aid is as simple and routine as eyeglasses or contact lenses.” As an international hearing aid manufacturer, Phonak takes in feedback from hearing aid wearers and hearing professionals across the world, using this knowledge to inspire their next models of hearing aids. With their partners, Phonak also works to break down the stigma attached to hearing loss. Phonak’s brand-new Belong Platform has been designed to simplify consumers’ lives with some of the most innovative technologies that have been created to date. Belong’s ease of use includes breakthrough lithium-ion battery technology, 24 hours of hearing on one single charge, and the market’s quickest charging and longest-lasting rechargeable battery. For 24 hours of hearing, Belong only requires three hours of charging. For those on the run, a half-hour charge will provide six hours of use. In a ground-breaking environmental innovation, Belong batteries last at least four years, eliminating the waste of traditional hearing aid batteries. In terms of hearing performance, Belong provides Phonak Audeo B-R with reliable and long-standing Phonak innovations of AutoSense OS and SoundRecover 2. These automatic features provide 20% better speech understanding. The new design is ergonomic and easy to use – with the push of a single button and an indicator light for battery charge. For those who lead active lives, or for those who simply require confidence of their hearing devices, Phonak introduces the brand-new Audeo B-R. The Audeo B-R was designed and built based on consumer desires for their hearing devices: a combination of communication and intelligibility, natural sound experience, connectivity, wearing comfort, tinnitus solutions, and of course, a rechargeable option. When fully charged, the Audeo B-R offers 24 hours of listening, and when used with a wireless connection, the Audeo B-R offers 80 minutes of streaming time. Wireless connectivity to smartphones and personal electronic devices allows wearers to stream phone calls, music, and other media directly to their Audeo B-R hearing aids. AutoSense OS in the Audeo B-R ensures automatic adjustments based on the wearer’s environment, which means wearers do not have to worry about making adjustments as they move through different spaces – providing a seamless and natural listening experience. Powered by the AutoSense Operating System (OS), Audeo B-R hearing aids provide wearers with an effortless listening experience. AutoSense OS senses a wearer’s surroundings, and automatically adjusts the wearer’s hearing aids to provide the optimal listening experience tailored to each person’s specific experience. Rather than fumbling with your hearing aids to adjust volume and features, Phonak Audeo B-R ensures a hands-free and natural experience. In terms of speech recognition, AutoSense OS empowers Audeo B-R hearing aids with 60% improved speech understanding by zooming in on preferred voices in noisy environments. Another new feature offers wearers 10% improvement in soft-speech understanding. Audeo B-R is available in the receiver-in-canal style, with a customizable mold made to fit the wearer’s ear canals. 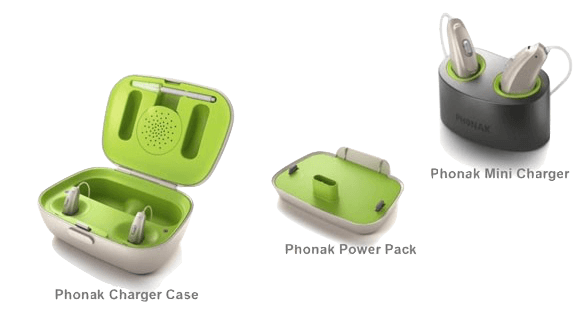 Audeo B-R is easily charged with several different charging stations – the Phonak Charger Case (charger, drying kid, and protective hard case); the Phonak Power Pack (ideal for short trips, where no power source is available); and the Phonak Mini-Charger (a compact size for travel).